“The New York–based Pollock-Krasner Foundation has announced the winners of 111 grants to artists and 13 to nonprofit organizations, with $3.17 million distributed over the past year. The foundation also named artists Squeak Carnwath and Blane De St. Croix winners of the Lee Krasner Award, in recognition of a lifetime of artistic achievement. A Color Removed, collection bins stationed around Cleveland, Ohio. Photo courtesy of FRONT. A Color Removed, by Michael Rakowitz, was conceived in 2015 in response to the shooting of 12-year-old Tamir Rice by the Cleveland police. Rice had been playing with a toy gun that had the orange safety tip removed when he was fatally shot. 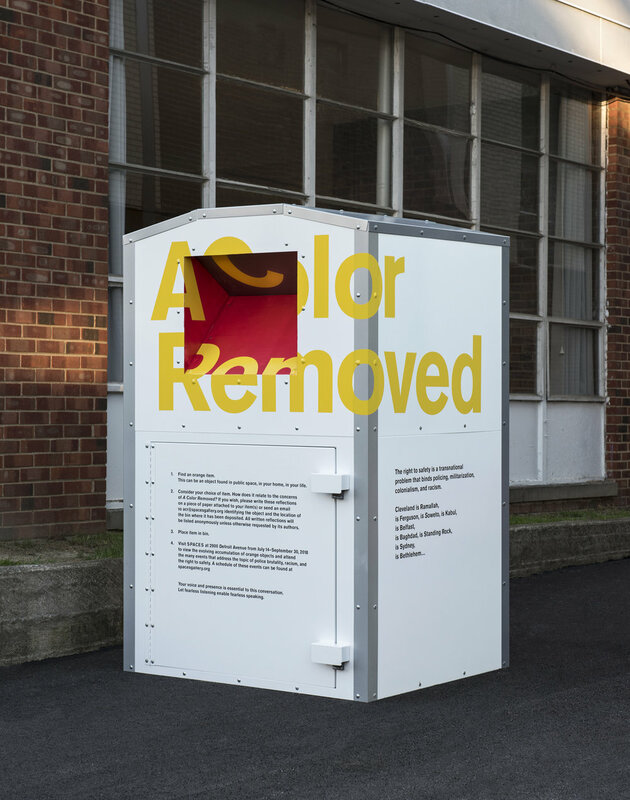 A Color Removed is a city-wide participatory project that confronts the use of the color orange as a symbol of safety and gestures to removing the color orange from the city of Cleveland and suspending its future use. The public art project directs attention to the way safety is distributed unequally within one community and how we can deconstruct the symbol of orange as a safe color to create true solidarity among citizens. The project has been included in FRONT International: Triennial for Contemporary Art in Cleveland Ohio. The collection bins for orange safety products are stationed throughout the city and their contents will be displayed at SPACES Gallery in Cleveland. The exhibition runs from July 14 - September 30, 2018. Please click here to read more about the project! Lucy Orta and London College of Fashion students at a banner making workshop at HM Prison Downview. Photo by Michelle Marshall. Sunday June 10th, women and girls in London, Cardiff, Belfast and Edinburgh will march together as part of a mass participation artwork. The PROCESSIONS march commemorates the 100-year mark of the Representation of People Act which gave the first British women the right to vote and run for public office. One hundred years later, Artichoke Charity is inviting self-identifying women and non-binary people to participate by marching and wearing green, white, or violet (the colors associated with the UK suffrage movement). One hundred women artists were commissioned to work with organizations across the UK to create banners for PROCESSIONS as part of an extensive public program of creative workshops. For more information please see the official PROCESSIONS website. The Historic England Organization commissioned Lucy Orta to commemorate the 100-year anniversary of the UK Suffrage movement and in memory of 1,000 suffragettes that were imprisoned at Holloway women’s prison during their struggle to obtain the vote. HMP Holloway in London was one of the most well-known sites associated with the UK suffragette movement. It closed in 2016 and 300 women were moved to HMP Downview. Lucy Orta has been working with prison inmates to design a series of stunning banners for the centenary PROCESSIONS march. Orta's project has been covered in Artnet and The Guardian. Activation of Michael Rakowitz’s Enemy Kitchen (2012–ongoing), with the artist at left, on the MCA’s plaza, October 1, 2017. Photo by Nathan Keay, © MCA Chicago. 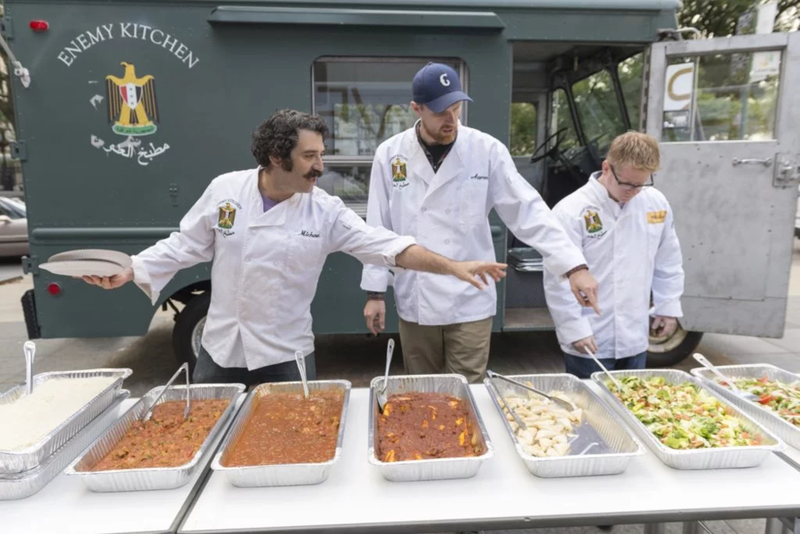 Visitors to the Museum of Contemporary Art Chicago this past fall may have stumbled upon a food truck where American veterans of the Iraq War served traditional Iraqi food. Enemy Kitchen (ongoing since 2003) is part of “Michael Rakowitz: Backstroke of the West,” which surveys 20 years of the Chicago artist’s work. Enemy Kitchen is a public art project by Michael Rakowitz that explores the relationship between hospitality and hostility. Rakowitz and his mother collected and compiled recipes from the Baghdad area. These recipes are turned into dishes which are served by U.S. veterans of the Iraq War from a food truck designed by the artist. Backstroke of the West is on view at MCA through March 4, 2018. James Clar part of Mana's New Media Program group show in Downtown Miami during Miami Art Week. James Clar will be part of STOREFRONT 2: LIMINALITY. An immersive environment, featuring installations by Lisa Park and James Clar that blur boundaries between virtual/real and physical/metaphysical, as well as dynamic light works by Pablo Gnecco and Alex Czetwertynski.